Like many people who read fantasy my journey into this wonderful genre was largely propelled at a young age by JRR Tolkiens classic "The Hobbit". For me it came from a completely unlikely source too - from my Gran who didn't seem to read much (at least that I noticed), didn't have many books and yet had The Hobbit along with Hardback editions of the Lord of the Rings. I have no idea how or why she came to be the owner of these books - something that may forever remain a mystery however I do recall the solid hardback covers that the Lord of the Rings trilogy were bound by. They had a quality about them, a re-assuring sense of the permanent that eludes many bound books today. The newly printed illustrated Hobbit has that same tactile sense, the quality is simply superb and feels like it could last a lifetime of reading. It is also one of the most visually pleasing books that I possess. 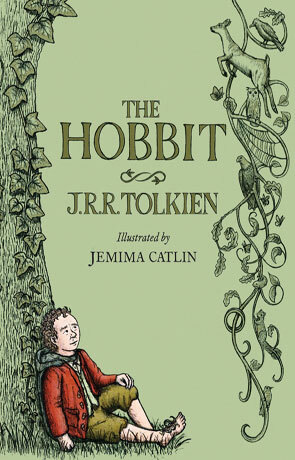 The illustrations by artist Jemima Catlin are absolutely spot-on and perfectly in keeping with the feel of the series; evoking that childlike sense of awe of Tolkien's work all over again. The type is large, modern, clean and nicely spaced. This is a book that wants to be picked up and is also the perfect size to read to someone younger. The story itself needs little introduction; The Hobbit, or There and Back Again is a childrens tale written by Tolkien in the 1930's and has received critical acclaim ever since, being nominated for the Carnegie Medal and winning a "best juvenile fiction" award from the New York Herald Tribune. It has been estimated to have sold between 50 and 100 million copies worldwide and is considered a classic of Children's literature. Along with Tolkiens later works - the Lord of the Rings (which began life as a sequel to the hobbit) it defined a whole genre for decades to come with countless derivatives and inspiring thousands of authors. It is without a doubt a landmark in literature and has been for many the beginnings of a lifetime of reading. As I write this Peter Jackson is getting ready to release the second part of the Hobbit film and it seems the ideal time to fall in love once more with Middle Earth or even begin a lifetime's love affair with Tolkien. Either way this edition is the one I'd choose. Update: This special edition is available on the official Tolkien site: Tolkien.co.uk. Written on 11th November 2013 by Ant.